Even before reaching a conclusion about the most popular currencies of the world, it is simply ideal to know what currency trading is in the world of Foreign exchange. It is vital for a forex dealer to learn the best way of evaluation while dealing with foreign exchange market with a thorough knowledge of turnover and level if liquidity. Foreign exchange markets are venues where individuals, industries and banks purchase and sell currencies making profits from investments. United States, Asia and Europe are the major markets of the world. Lists of best currencies are available but it is to be remembered that the ranking is purely based on the trading volume of currencies at the three major forex markets. Major changes are expected soon but as of now, the top currencies are as listed below. In spite of the unstable conditions, the US Dollar is listed as the most overriding currency today. When studied quantitatively, around ninety percent of the global transactions contain the US Dollar. Thus all the other currencies are assessed in comparison to US Dollar as the standard currency. The US dollar, through the process of ‘Dollarization’, has been adopted by British Virgin Islands, Ecuador, East Timor, El Salvador, Federated States of Micronesia, Marshall Islands, Palau, Pitcairn Islands, Panama, Turks and Caicos Islands which made the currency further dominant. The second currency in line is Euro, which is the endorsed currency of 16 countries that form a part of the 27 member European Union. It is recorded for around 37 percent of transactions done in the Foreign exchange trade. Countries using Euro as currency, belonging to the Euro zone are Austria, Belgium, Cyprus, Finland, France, Germany, Greece, Ireland, Italy, Luxembourg, Malta, the Netherlands, Portugal, Slovakia, Slovenia and Spain. Besides more than 175 million people use currencies attached to the Euro which includes more than 150 million people from the continent of Africa. As per records of 2008, Euro is the second most popular currency making Euro zone the second largest global economy which is also liable to change. About 20 percent of trade being done daily, Yen is recorded to be the third most heavily traded currency of the world. The Japanese Yen was officially implemented on 10th May 1871 and hosted in July 1871. Officially named as pound sterling, is often quantified against US Dollar and accounts for 17 percent of daily Foreign exchange trade. The Official name, pound sterling is used only in formal milieus to extricate the United Kingdom currency from other currencies that bear an identical label. Though considered to be a very complicated and unregulated currency in the early 19th century, today it comes in the top five currencies which have a trade transaction of 6 percent in the three major markets daily. The only version of the Franc is still the Swiss Franc even today issued in Europe. With four percent of trading, daily in the Forex market, the Australian dollar is popular with currency traders due to the chances of high interest rates. The name of the currency would have been ‘royal’ if not for the disapproval of the people of Australia who opted in favour of the Dollar. Being number seven as one of the most heavily traded global currency, the Canadian dollar also is recorded to have four percent forex trade in the major markets. 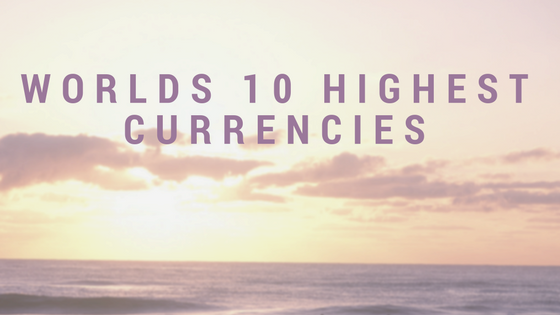 Accepted to be in the list of the top ten currencies, the Swedish Krone also accounts for more than two percent of forex trade. The Swedish Krona was the currency of Sweden from 1873. Ranking ninth among the heavily traded currencies, this currency claims nearly two percent of transactions in the Foreign exchange market. On declaration of Hong Kong as free trading port in the year 1841, other foreign currencies including Indian currency become popular for trading. Today the Hong Kong dollar is abbreviated as $ or KH$, when it is necessary to differentiate it from other currencies. Last but not the least, still in the top ten list of the greatly traded currencies in the major market, their daily transaction accounts for 1.5 percent of the total trade. Krone being introduced in 1875, Norway joined the Scandinavian Monetary Union. This article was super helpful and on point, thank you so much. I’m reading all the other articles as well.